Focusing on sites of key significance and the world’s first civilizations, Ancient Lives is an accessible and engaging textbook which introduces complete beginners to the fascinating worlds of archaeology and prehistory. Drawing on their impressive combined experience of the field and the classroom, the authors use a jargon-free narrative style to enliven the major developments of more than three million years of human life. First introducing the basic principles, methods and theoretical approaches of archaeology, the book then provides a summary of world prehistory from a global perspective, exploring human origins and the reality of life in the archaic world. Later chapters describe the development of agriculture and animal domestication and the emergence of cities, states, and pre-industrial civilizations in widely separated parts of the world. 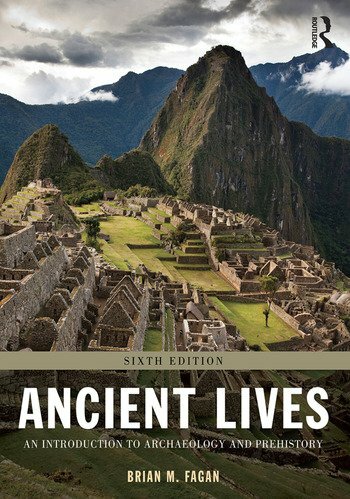 With this new edition updated to reflect the latest discoveries and research in the discipline, Ancient Lives continues to be a comprehensive and essential introduction to archaeology. Chapter 4 How Did People Live? Brian M. Fagan is one of the world’s leading archaeological writers and an internationally recognized authority on world prehistory. He is Emeritus Professor of Anthropology at the University of California, Santa Barbara. Nadia Durrani is a Cambridge University-trained archaeologist and writer, with a PhD from University College, London, in Arabian archaeology. She is former editor of Britain’s best-selling archaeology magazine, Current World Archaeology and has authored and edited many articles and books on archaeology from every corner of the globe.